Conquer a variety of culinary endeavors with help from Panasonic’s automatic rice cooker. Create light, fluffy, restaurant-quality rice–perfect for side dishes or stir-fries. Or make sticky rice for rolling sushi, Spanish rice for enchilada night, or hearty wild rice to add to a tossed green salad–or even creamy rice pudding with cinnamon sprinkled on top for dessert. The small electric appliance takes care of cooking the rice, so that busy moms and dads can focus on getting the rest of the meal prepared and on the table. Panasonic’s automatic rice cookers come in four useful sizes. Choose from a 3-cup, 6-cup, 10-cup, or 20-cup cooked-rice capacity–great for single people and small families or for larger-size families or for those who love to entertain. for effortless food release and quick cleanup. Novice or pro–any home chef will appreciate the convenience of having a little extra help in the kitchen. Simply add rice to the cooker, pour in the measured amount of water, secure the lid, and press the lever to start cooking–it takes care of the rest. The rice cooker’s inner aluminum cooking pan heats quickly for fast, even heating, while its glass lid traps in heat, moisture, and nutrients, plus allows for at-a-glance monitoring (no need to remove the lid). When cleaning the rice before cooking, do not wash the rice in the cooker pan. For best results, it is recommended that a separate pan be used for cleaning the rice. The rice cooker automatically cooks the rice for the correct amount of time, then shuts off automatically for excellent results. 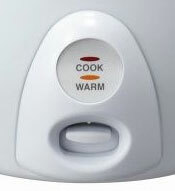 Even more, the 10-cup and 20-cup units automatically switch over to a Keep Warm mode, which keeps the rice hot and delicious–and ready to serve–for up to four hours, without over-cooking. A nonstick coating on the removable inner cooking pan (most models) helps prevent cooked rice from sticking to the sides and the bottom and makes cleanup a snap. Other highlights include a handy “cooking” indicator light, stay-cool lid and side handles for safe transport, secure feet to keep the cooker raised up above countertop surfaces, and a sleek, modern design that will be sure to compliment any kitchen decor. A measuring cup comes included, as well as a rice scoop (all sizes, except for the 10-cup cooker), and a steaming basket (20-cup cooker only) for steaming seafood or fresh vegetables while simultaneously cooking rice. Leave the rice cooker out for easy access throughout the week or store it compactly away between uses. A welcome addition to any busy kitchen, Panasonic’s line of automatic rice cookers make a great gift idea and carry a one-year limited manufacturer’s warranty.